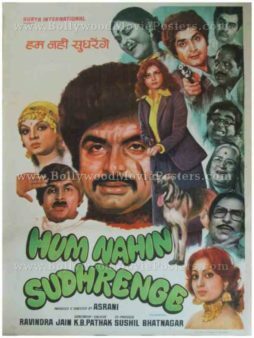 Old Bollywood poster for sale of the Hindi comedy movie Hum Nahin Sudherenge (1980). This is an actual surviving original Indian comedy movie poster of the 1980 Hindi film that was produced and directed by ace Bollywood comedian Asrani. Printed and circulated during the first release run of the film (somewhere in the early 1980s), this Hindi comedy poster was originally designed for publicity of the film but never ended up being used. This old Bollywood poster was originally hand painted on canvas by a leading poster design studio in Bombay. A large stunningly realistic hand painted portrait of Bollywood comedian Asrani is seen prominently in the center of this Indian comedy movie poster. The lead actress is seen with a German Shepherd dog alongside. Another smaller hand painted portrait of the comedian appears on the left in a hilarious pose. A third portrait of Asrani holding a gun is seen on the top right of this Hindi comedy poster. Several superbly hand drawn portraits of actors Mukri, Madan Puri, Rita Bhaduri and Aruna Irani among others are seen on the right. In total, this hilarious Indian comedy poster features a dozen hand drawn faces and a dog!